I KNOW Penrith Panthers head Phil Gould isn't on the Christmas Card list of many Queenslanders. He does tend to know everything especially during State of Origin telecasts. 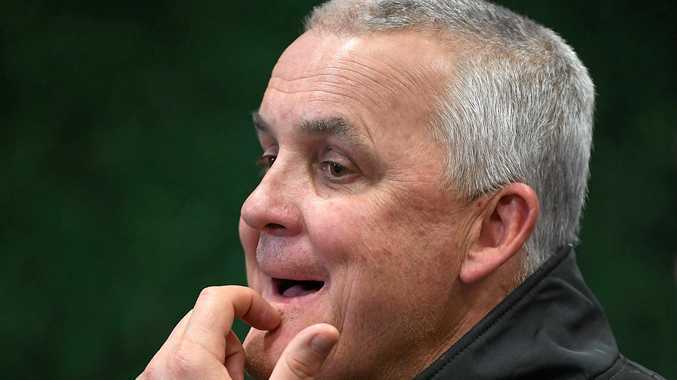 The news that Panthers coach Anthony Griffin has been given the chop is surprising, especially as the Panthers have 13 wins from 20 games to be in fifth place. Fifth out of 16 isn't bad. Gould talked about Griffin not doing what he was told to do but any team that wins two thirds of games is doing something right. I have never met Griffin but reckon he is a great ambassador for the sport. If they go worse with a new coach, perhaps the Panthers better look elsewhere for a fix of the problem. The Brisbane Lions are third last on the AFL points table but I don't hear all the calls for the sacking of coach Chris Fagan. The Lions have come good in the past month but even before that, there wasn't a lot of talk about the coach getting the sack. Some teams are works in progress and that looks like the Lions of 2018. People sometimes forget, one team has to come last. Some just haven't the players to make a top eight. I was amazed at the positive attitude of the Brothers club after losing all four TRL games to Warwick last Sunday. THE Warwick and District Junior Rugby League is moving into the second last week of the 2018 fixture season. This Saturday, Eastern Suburbs are at home to Goondiwindi in games that will have an impact on finals positions. Eastern Suburbs will qualify for the under-14 semis and there is a chance they will make it in the under-16s. MIT Jets and Collegians will play at the North Ipswich Reserve and Stanthorpe will host Tenterfield. The finals series is over three weeks starting August 25. THE Toowoomba juniors are planning to set up a girls competition in rugby league. Currently the girls in Warwick and District are playing leaguetag which is basically rugby league without the tackle. A short kick is fine in leaguetag which does give a point of difference to touch. There are Warwick girls in Darling Downs representative rugby union squads this season. I think it is about time sports like league and AFL go with a fair dinkum women's competition like they do in cricket and football rather than a short competition at the beginning or end of the season. There is a lot of women's sevens rugby but more could be played in the 15-player game.